Overall design concept for the Park renovation was approved by the DRB in March. Needing further refinement and Board discussion is the fencing along Collins Avenue, playground equipment, and the park lighting plan. Plan details here. The oceanfront property is located in an RM-3 district – residential, multi-family high intensity. The allowable height for the property is 200 feet and 22 stories. The proposed project is 200 feet with 18 stories. Designed by Arquitectonica Architecture and Interior Design, it includes 86 units with the required 185 parking spaces. The existing building, Marlborough House, was built in 1962 and was designed by Giller, Payne & Waxman Architects “in a simplistic Miami Modern style.” It stands 111 feet and has 107 units. As a result, Staff is recommending the architect “reorient” the building on the site, include greater side setbacks than proposed, and “refine the hard edge condition of the balcony design to soften the massing upon Collins Avenue.” While recognizing the desire for the best possible water views, the memo states, “in reorienting the building, most, if not all units, will still have full views to the Atlantic Ocean and beach. Finally, Staff expressed concern with regard to plans for two subterranean parking levels in the proposal believing they conflict with the City’s efforts to create new construction standards to combat sea level rise. “While there are design benefits to placing parking underground and eliminating a parking pedestal, most notably the elimination of an unsightly parking structure, subterranean parking conflicts with the City’s support of new building standards to mitigate the impact of sea level rise.” They note a Code Amendment that would prohibit below grade parking is currently before the City Commission. 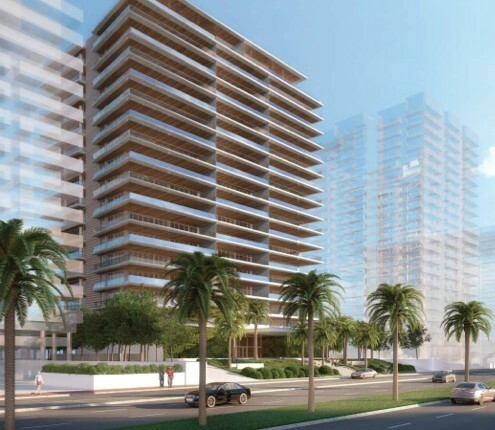 Residents of five neighboring buildings – Seacoast, Royal Embassy, L'Excellence, Villa Di Mare and 5838 Collins Avenue – have contacted City Commissioners, DRB members, and RE:MiamiBeach with regard to the project. They plan to turn out wearing blue shirts at next week’s meeting to oppose the loss of views and to seek a public beach access point.